"He has provided a calm and lucid portrait of a stormy people, and his writing sometimes approaches that of Rebecca West's Black Lamb, Grey Falcon in its depth of knowledge and piercing insight into what is to most people a savage land." With this sense of historic complexity in mind, Will Myer travelled to the troubled Balkans in autumn 1994 and the following spring. His aim was to discover the political and human reality of a region beset by conflict and controversy, fought over for centuries by rival powers. In particular, he sought to explore the true nature of Macedonian identity, or rather of a multiple identity.Travelling in Turkey, Greece, Bulgaria and the newly independent Former Yugoslav Republic of Macedonia, Myer encounters a bewildering array of political and cultural opinions-Orthodox Christians and Muslims, Communists and nationalists, warlords and modernisers. His investigations take him to Orthodox weddings and Easter parades, political meetings and religious ceremonies. He encounters widows and witches, dervishes and mystics. 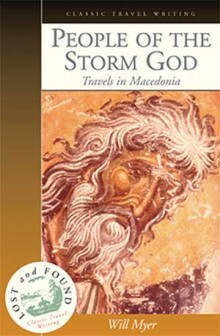 Throughout, he remains fascinated by the human dimension of Macedonia’s deep-seated identity crisis.More than a simple travelogue, People of the Storm God casts light on the troubled history of Macedonia and its unique melting pot of politics, religion and ethnicity. Compared to the work of Patrick Leigh Fermor, this book evocatively reveals the extraordinary cultural diversity of the Balkans and the weight of history borne by its different peoples. DR WILL MYER (1968-2002) developed a passion for the Balkans as a teenager in the mid-1980s. His book Islam and Colonialism: Western Perspectives on Soviet Central Asia was published by Routledge Curzon in 2002. At the time of his death he was working on a book entitled Islamic Fundamentalism: Tamerlaine’s Revenge.